Styling A Trench Coat For Spring. I don’t usually write much about fashion, but if there’s one thing that I love, it’s the classics. I love flicking through style books that show how fashion has evolved through time and watching old movies to admire the wardrobe on set. One of my ultimate favourite pieces in my wardrobe is a classic beige trench coat. It’s actually only recently that I’ve paid more attention to what I buy, and although I’m all up for fun, affordable pieces from Primark, I prefer to invest more in the pieces that I know I’ll be wearing over and over again for years to come. Saying that, I don’t quite mean I can afford to splash out on a Burberry – as much as I’d love to, it’s not possible for a while. 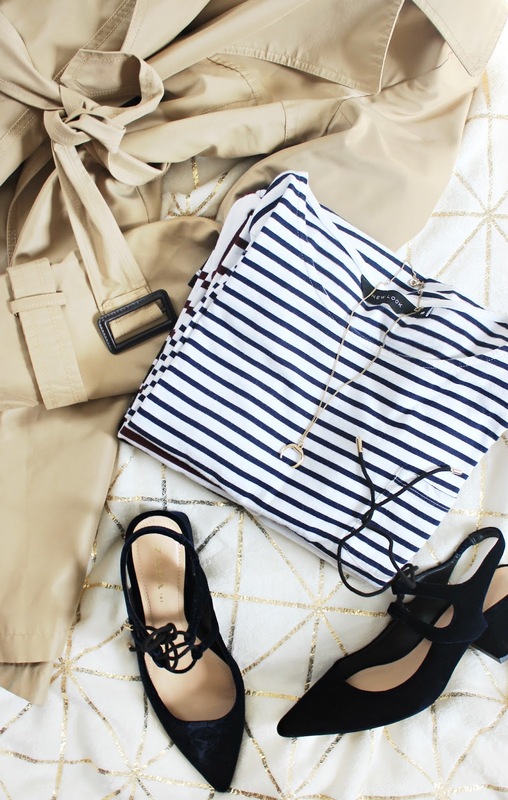 However, I’ve found a gorgeous beige trench coat* from Jack Wills, so I thought I’d share three ways I’m styling it for Spring. 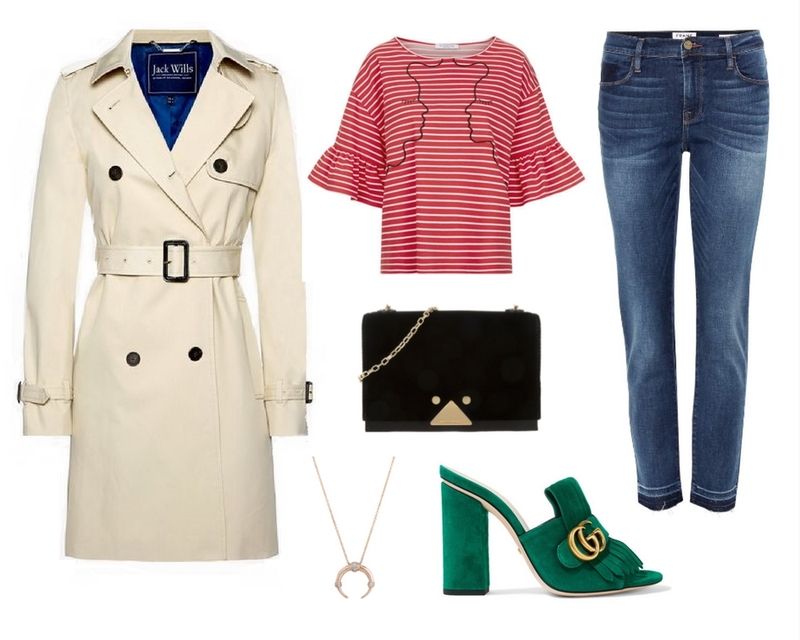 One of my most worn ways of wearing a trench coat is which a classic tailored shirt, some dark wash skinny jeans and pointed flats. There are so many variations of this pairing that it looks different every time. You can switch up the colour of jeans or switch up the gold accessories for silver ones, depending on what suits your personal style. I find that a fun way to tie the look together is through pointed shoes, and so I have a variety of different styles of this shoe in my wardrobe. I often buy mine from Zara, as they often have a brilliant selection and they last well too. A trench coat doesn’t just have to be styled casually – it works great with business formal wear too. I love how sleek monochrome colours look underneath the beige, it really seems to tie the look together beautifully. I’ve opted for pointed black heels as I’m all about the pointed toe to elongate my (very short) legs, and the simple black and white stripes on the blouse keep it looking bold but elegant. Styled with a black bag and some subtle accessories, it’s the perfect look for when you want to look formal and stylish. This look is the most fun, and I love how many colours there are! The red and white breton stripe is my new favourite shade combination, and paired with the ruffle sleeves and shoulder detail, this blouse is one of the cutest I’ve seen. Boyfriend jeans have been in for a few years now, and they work perfectly underneath the trench, especially paired with some fun coloured mules. Mules have come around in a big way and there are so many different patterns and styles, from velvet, to fur to embroidered fabrics. There are so many more ways to style such a classic piece but these are three ways that I’m loving for Spring. I don’t usually write too much on fashion, but let me know if you liked this type of post and I’ll see if I can create some more style-related content! What are your key style pieces for Spring? Previous Post My Spring Beauty Wishlist. Next Post My Favourite Places To Purchase Jewellery.